After breakfast and gymming, we started out today's staycation staycursion biking over to the brand new (4 days old) Littlejohns toffee and chocolate shop on Market Street at the tip of the Tenderloin. The place has an upbeat fun vibe, a young peppy updated version of stalwart See's Candies. The staff loves watching customers take first bites of their confections. They got almost as much pleasure of watching us bite into the English Toffee and the Caramel-covered honeycomb as we did tasting them. We walked out with several pieces of chocolate, having spent only a couple bucks. Their other location is in the touristy Los Angeles Farmers Market. Who are they targeting here: tourists or locals? Are they hoping to sell in bulk or by the piece? 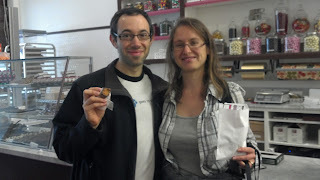 Regardless of lingering questions of their business plans, the confections were highly enjoyable. 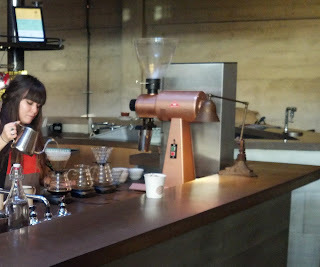 Minutes later, we had biked over to Sightglass Coffee & Roaster in SoMa. They have a large loft, more spacious than most Mission cafes, with some people bringing their bikes indoors and leaning them against the large sacks of coffee that line the cement walls. 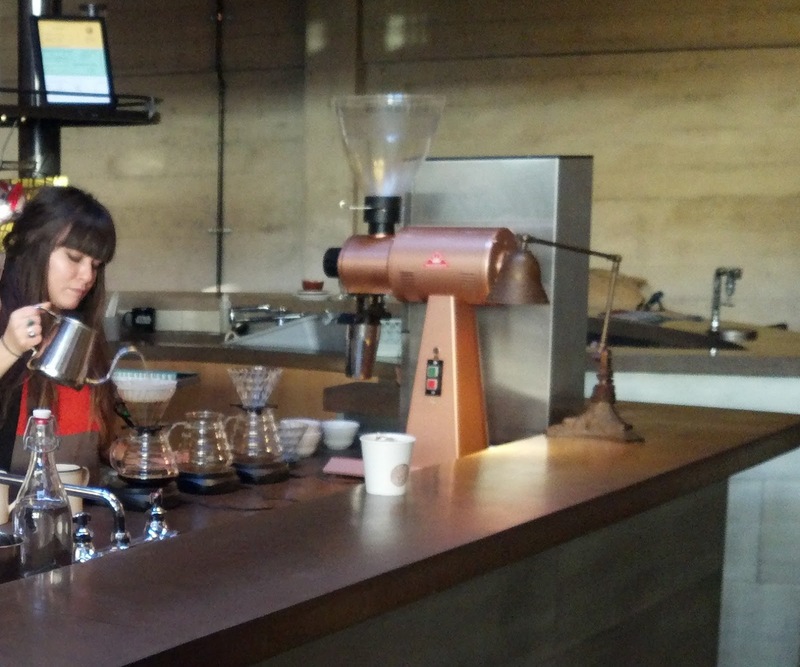 I would describe it as a more comfortably spacious and slightly less pretentious version of Four Barrel Coffee. Like Four Barrel, there are no power outlets or wifi. In fact, than are fewer outlets than you would find almost in almost any random space this size. All equipment has power conduit run so there are no exposed outlets to be found. How do they vacuum cobwebs or buff the floors? We both ordered the "pourover" (cup-at-a-time drip) - Olga having the Blueboon Blend and me getting the Finca Cuminate from Costa Rica. I enjoyed mine about the same as yesterday (not amazing), Olga liked hers slightly more than yesterday, neither of us have been terribly impressed with our fancy roasts so far during this experiment. Without wifi and power, the clientele seems to mostly be reading books and kindles, chatting politely, writing... more creating and producing than consuming. Perhaps the sour coffee helps folks stay focused on whatever they are creating. Get some espresso already :-) Guess that's too ordinary fer ya.